Did you know we have an online client portal called Snapshot™? It is a valuable tool our clients can use to gain information about their entities, file their annual reports, manage their payments and invoices, or review resources for each of the 50 states, and much more! If you have a company where Incserv is the registered agent, you can use Snapshot™! There are two ways to login. If your company is under your client account (and not, for example, your law firm’s), you want to login with your email and password on the left. 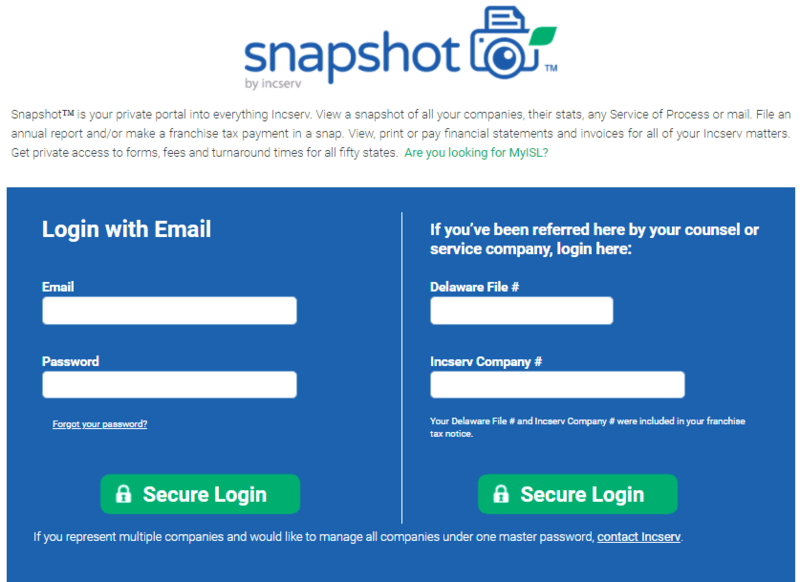 If you have been sent to Snapshot™ by your legal counsel (or someone else), you want to login using your DE file number and Incserv company number on the right. How do you tell? If you receive a bill from us directly every year for registered agent services, that usually means that your companies are under your client account. If your law firm (or other company) forwards you our bill or bills you directly, then your companies are under their account. Please note, if you login with your DE file number and Incserv company number, you can only file your DE annual report in Snapshot™. Logging in with your username and password ensures you have full access to everything our client portal has to offer! If you still aren’t sure, give us a call! We can let you know if your company or companies are under your client account. And if you have more than one company and they’re under multiple client accounts, we can condense them for you so they’re all under one client account. If you don’t have a password, you can either give us a call or use the “Chat With Us” function on the lower right of your screen. We can then quickly set you up with either a random password or a password of your choosing. Check out our next Snapshot™ blog where we’ll discuss the different features of our client portal. Also stay tuned for more posts in our Snapshot™ blog series where we’ll show you how to utilize everything to the fullest!